Hello ... Hello ... my old friends ... It's great to see you once again! I am always pleased to highlight those talented musicians out there in the ELO Beatles Forever [ELOBF] universe who either re-interpret or are influenced by or even compose music about [surprisingly enough!] ELO! 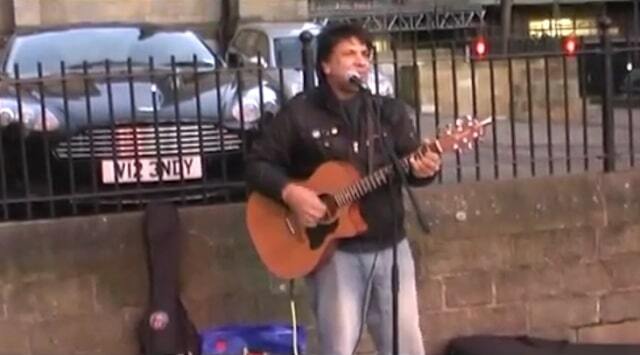 And this week I have come across a great new tribute song to all things ELO by a Leeds based musician [and DJ] whose name is Gee Sunray, who wrote a song last month entitled "ELO My Favourite Band" and performed it last week on the streets of Leeds. This is a song about my favourite band and they are called ELO. They toured the world a classical band from Birmingham. They toured the world a classical band from Birmingham." Yours Truly KJS thinks that you'll agree that Gee's song and lyrics are both truthful; ingenious and give great honour to Jeff Lynne and his ELO song legacy. ELO Beatles Forever [ELOBF] is happy to support and promote independent musicians like Gee Sunray who ply their trade in the ELO [and related artistes] universe. Thanks Keith for the mention. However I have written further more songs about E.L.O - Hey Mr Jeff Lynne (E.L.O), i got my E.L.O tickets, A song for Jeff Lynne, Who do you see behind your glasses and The bands is coming into town. Should I make a album. Let me know ?